Mizo Zirlai Pawl (MZP), the apex students’ body of Mizoram threatened a rerun of the armed uprising in 1966 if the Centre continues to neglect Mizoram with regard to the citizenship bill. 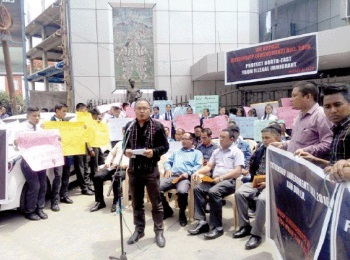 Addressing a sit-in demonstration to protest against the Citizenship (Amendment) Bill, 2016 in Aizawl on Monday, the MZP president L Ramdinliana Renthlei squarely blamed the Joint Parilamentary Committee (JPC) for not visiting Mizoram during its tour to the Northeast. He also questioned the Centre whether New Delhi considers Mizoram as a part of the country. He also said that all political parties of the State and NGOs had requested the JPC to visit the State while submitting memorandums opposing the controversial bill. But unfortunately the JPC gave Mizoram a miss during their extended tour to the north-eastern region, he lamented. The MZP president also warned of armed rebellion and seek help from ‘outside forces’ to establish ‘self-determination’ if the Centre passes the citizenship bill ignoring the sentiments of the people of Mizoram. The sit-in demon station in front of Vanapa Hall was held as part of North East Students’ Organization protest organized in all the capital cities of the seven north-eastern states. He further said that the citizenship bill if passed will adversely affect the demography of Mizoram. “The Citizenship (Amendment) Bill, 2016 is harmful for the people of Mizoram and the bill, if passed, will immensely affect the Mizos as Mizoram harbours many illegal immigrants from neighbouring countries,” he reiterated. He also urged all political parties of the State to oppose the bill. Renthlei also called upon all Mizo people to unite in opposing the bill.